Ultimate Masters has hit the market and there’s already been a lot of movement. The prices of the reprints dropped as they usually do when a set first hits the market. But it seems like the prices have started to rebound a lot quicker this time around. There’s a slight possibility they could drop again as more supply hits the market since we don’t really know what the final numbers will be, but I wouldn’t hold my breath for that. Instead, let’s take a look at what’s happening in the metagame to see if we can spot some more cards that might be good pickups or cards we should get rid of. In article #21, I mentioned Collected Company as a card to keep an eye on. Cryptic Command is another target since it also didn’t get reprinted in Ultimate Masters. If you need or want a playset, this is probably a good time to get one. I don’t think this card will spike anytime soon, but it should certainly hold its value or even slowly go back up over time. The casting cost prohibits it from seeing play in many types of decks. But it still sees a lot of play in control decks, and many of them are doing quite well. Take a look at Yuta Takahashi’s top eight Dimir Control deck from Grand Prix Portland. This deck just got a lot cheaper with all the reprints from Ultimate Masters, which includes Snapcaster Mage, Liliana of the Veil, Bitterblossom, Creeping Tar Pit, and Engineered Explosives. And don’t forget about Spellstutter Sprite, which I mentioned in article #18. Plus, there’s the Cast Down promo I highlighted in article #9. Another card that sticks out from the list is Hero’s Downfall. If you can get the promo version for under $4, that’s probably a decent deal since it also sees play in over 19,000 EDH/Commander decks. 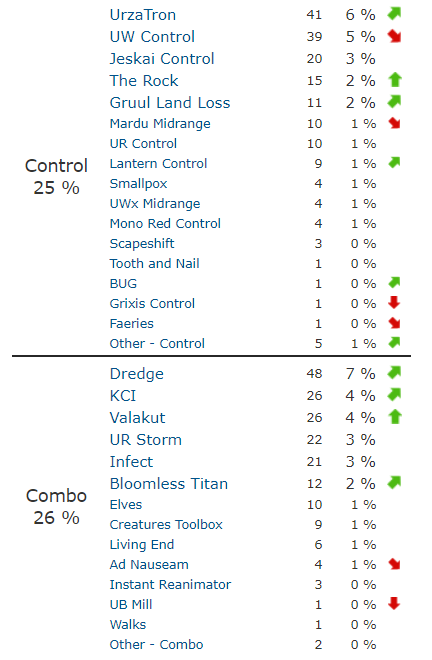 Not only did Cryptic Command have a good weekend in Portland, but it also had a good showing at Grand Prix Liverpool. Take a look at Daniel Ballestin’s Azorius Control from the top four. I mentioned Extirpate as a pickup in article #22 since we’ve started to see an uptick in Modern Mill thanks to Mission Briefing. However, if you’re not into that kind of deck and you have Hedron Crabs lying around, you might want to consider locking in some value now. There’s currently only one printing of the card, so I could see the possibility of a reprint. But I think the Landfall mechanic is a little bit harder to reprint in Standard and Ultimate Masters will be the last Masters set for a while. So with that said, foils might be okay to hold onto. I don’t think we’ll ever see these at $90-100 again, but this has dropped to a price near its initial sleeper release price. With that said, I don’t think this card can go any lower and has nowhere to go but up again. However, I don’t think foil Magic Origins versions are a good buy since there’s a From the Vault: Transform version. But if you have extra cash and want some nice ones, I’d go for the SDCC 2015 version soon as they’re starting to creep back up in price. I wish I could’ve highlighted this a bit earlier. But I only thought about it this past weekend to possibly try it in Izzet Phoenix. And now that’s even a bit too late since other people have already executed on the idea. 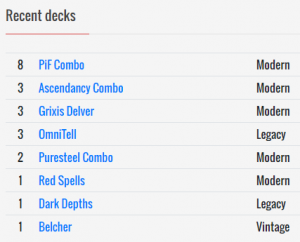 Check out a Carlos Moral’s second place list from Grand Prix Liverpool. I think this could become a staple in the deck as it gives the deck more things to do on turn two and really helps to fuel your hand with more spells while increasing the chances of putting Arclight Phoenix in the graveyard. It’s also very easy to get rid of the extra copy or copies if you run into them. I submitted another buylist order to Card Kingdom. But I’m still debating on what to get with the store credit I’ve been banking. I’ve been thinking about the Masterpiece version of Engineered Explosives, Scalding Tarns from Modern Masters 2017, Dual Lands, or just holding on to the credit. I don’t know. If you have some good ideas, let me know. Tweet this article on Twitter and tag me with you suggestions, and I’ll send you (limited to the United States) a playset of Fiery Temper FNM promos. I waited too long to sell Treasure Map and lost a few dollars. Thanks to Sigmund Ausfresser on the tip from Office Hours #3 about Alpha basic lands. I bought these about four years ago for about $3-4 each. But I stay away from using them in tournaments to avoid any warnings because of the rounded corners. Plus, I’ve shifted to Snow-Covered lands (highlighted in article #9) instead of regular basic lands for Modern and Legacy decks. I was surprised to see Heroic Intervention at $4. It only sometimes sees play in the sideboard of Modern Elves and Auras. Plus, people only play one or two copies and it is a very situational card. I decided to start a new category to highlight some interesting cards once in a while. I came up with this category as a result of stumbling across the price of this card as well as the next one. 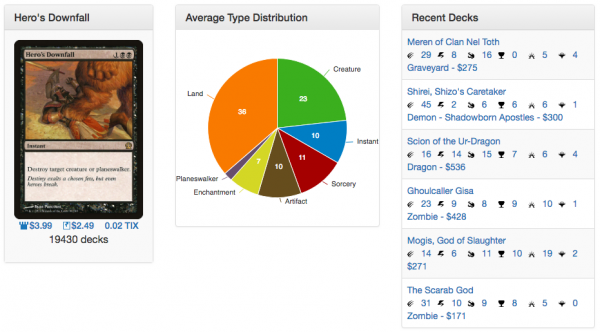 The price has really crept up over the last year owing to these decks with Modern Storm as the most notable deck. I doubt Wizards will ever print new cards with Phyrexian mana on them again as it was a design mistake. And Ultimate Masters will be the last Masters set for a while, so this card could continue to climb. As another extension to Sigmund Ausfresser’s article about old foils, take a look at this gem. This is another card that is tough to reprint because it’s a free spell. And one that gives decks like Legacy’s Rakdos Reanimator a way to deal with enchantments, which is a card type that’s generally tougher for Rakdos to manage. Take a look at Ourfriendthatguy’s list for example. Aside from this series and the MTG Questions series, I’ve been thinking about doing another series that focuses even more on the different metagames. But in this case, I would like to focus on decks that might be falling out of favor at the current moment. And as part of that, I would like to look at cards that you might want to get rid of if you were to stop playing the highlighted deck and move into a different deck to help you get the most value out of the transition yet continue to build your collection. Thus, I decided to try this section here first before I consider making this is own series. Let me know what you think of this section in the comments. Thanks. For this instance, I’d like to focus on Modern Humans. The deck has been quite popular and powerful for the last year or so now. But I think the deck is starting to fade a little bit. It’s a known deck, and many people have said Bant Spirits is a better Aether Vial creature deck now thanks to Supreme Phantom. Keep in mind, this might be a bold claim. But I’m trying to be as objective as I can via the data that I’m seeing. 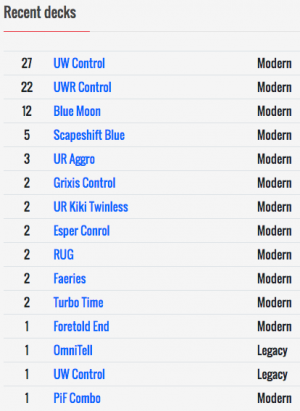 There weren’t any Humans decks in the top eight of Grand Prix Portland. And yes, we have to be careful about only looking at top eight decks. And that’s only one tournament. But there also weren’t any in the top eight of the SCG Invitational. Yet there was one in the top four of Grand Prix Liverpool. However, those two tournaments are a little skewed since the Invitational was a combination of Standard and Modern and Liverpool was a Team Unified Modern tourney. 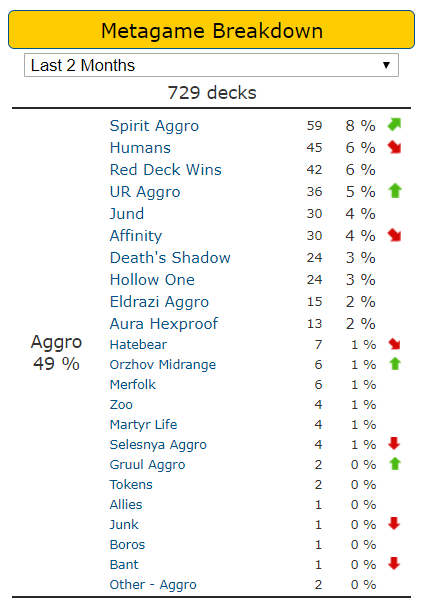 But if you look at the decks with a 7-1 or better record from the Invitational, there aren’t any Humans decks. Yet, there’s one in the list of 8-0 decks from Liverpool and one in the list of 5th through 10th place decks. So it’s still a bit tough to say that Humans is really falling off the radar. But I would say it doesn’t have quite the presence it did six months ago. So if you wanted to break apart your Humans deck, what cards could you possibly get rid of first? Let’s take a look at Ricardo Sanchez’s deck from Liverpool as a reference. The easiest deck to transition to that’s probably still kind of on the rise is Bant Spirits owing to most of the value residing in Noble Hierarch, Aether Vial, and Horizon Canopy. Cavern of Souls also contributes to the bulk of the deck’s value but doesn’t see play in Bant Spirits often. So you might want to consider getting rid of them to make the transition even less costly. But keep in mind, Cavern of Souls just got reprinted in Ultimate Masters. So you’ll probably take a little bit of a hit on these if you decide to move them now. But if you want to stay ahead of the curve, that small hit might be worth it in the longer run. 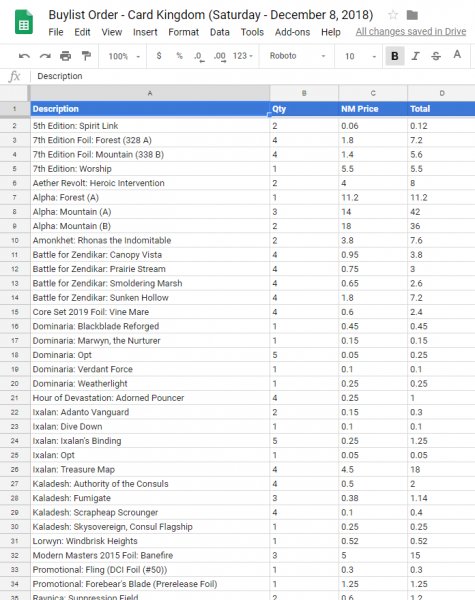 Here’s my buylist to Card Kingdom on December 8, 2018. 1. Tweet this article on Twitter and tag me (@edwardeng). 2. Let me know what I should from Card Kingdom get and why. 3. If legit, I’ll send you a free playset of foil Fiery Temper FNM promos.